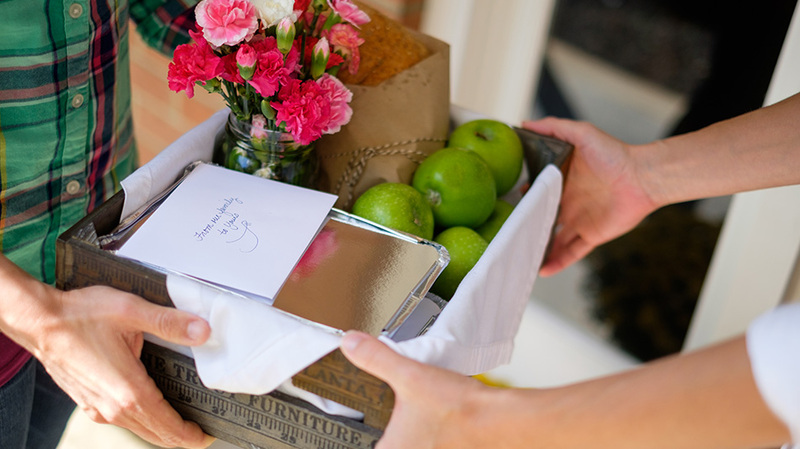 There is nothing better than having a friend bring you dinner when you or a loved one is just home from the hospital. A few years ago I had wrist surgery, and even though it wasn’t a huge deal, it was such a relief to have several friends bring in meals for my family as I was coming off the anesthesia and still on pain medication. And of course, bringing home a new baby has all sorts of surprises, so receiving meals then has been a huge blessing as well. I am eager to help give this service of hot, good food to my friends and family, but every time an opportunity presents itself, I draw a complete blank as to what on earth I could possibly bring!! So, I sat down to brainstorm some easy, transportable, and delicious meals that will give you plenty of options when it’s time to help out a friend or neighbor. Pasta Bake, with Fruit Salad and Rolls- Any pasta is fairly easy to bring to a friend, but a pasta bake is conveniently already in a dish, and generally includes other interesting ingredients and flavor like bacon, sundried tomatoes, green onions, artichokes, and more! Kids generally like pasta, and it’s quick and easy to reheat. Rolls pair well with this, and if you include a bunch they make a great snack even after the pasta is gone. And as a side, fruit salad. The most memorable thing I’ve received is a giant bowl of bite size fruit! Nothing tasted so good after delivering a baby as that never-ending bowl of strawberries, mango, kiwi, peaches, blueberries and raspberries. I ate it for breakfast, lunch, dinner and everything in between! Curry with Rice, Naan, and side of Cucumbers- Another great one pot meal, served over rice. When making it for someone else, I go easy on the spice, and include some extra heat (curry paste, or cayenne flakes) on the side. It is nice to have something other than pasta or casserole brought in, and a good curry packed with veggies and protein is a great alternative! I bring the curry completely cooked, just in a Tupperware to heat up, and then a disposable dish with plenty of rice to serve it over. Always include more rice than you think, because if they don’t end up using it with the curry, it would make a great snack or breakfast topped with cinnamon sugar and milk! Curry isn’t even curry without naan, so be sure you don’t forget to include that! I like to round it out with some sliced cucumbers, which makes for a crisp, fresh side. 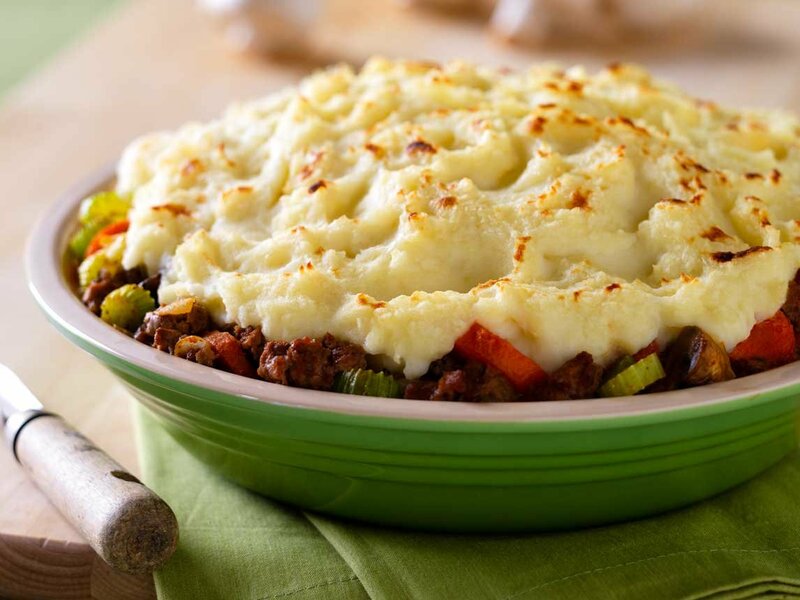 Shepherds Pie, with Green Salad and Garlic Bread- It’s comfort food. It’s hearty, tasty and refrigerates well for leftovers. I like that it is one dish, and has lots of flavor and variety in texture. You can include a side of mashed potatoes to eat as a snack, or to offer children who may not go for the entire dish. I have brought this to a friend with a bag of lettuce, and a separate Ziplock with the salad fixings and bottle of dressing to assemble once the family eats. It’s kind of fun to bring a special drink and/or a loaf of garlic bread. It makes for a big, hot meal that tastes great when times are tough! My kids both had hand foot and mouth disease this past winter, and the day my friend showed up on my porch with a take and bake pizza and bagged salad felt like the best day of my life! While homemade is always better, even something as easy as a pizza or a rotisserie chicken is just as appreciated when someone is really in need of a good meal. What are some of your go-to meals to bring to a friend?! I’m excited to hear in the comments below!